William Nightingale at the controls of a steam traction engine, driving a threshing machine. A long belt connects the thresher to the large wheel behind William's back. On the left of the photo is a large, well made and very well roofed haystack. Nine labourers are visible working on the thresher, a stack of empty sacks are being filled with grain, and a full sack being wheeled off to the right. A lad aged about 4 is helping by carrying an empty sack. William was born at Ashover and married Harriet Dakin of Matlock. In 1901 they were living at Masson Terrace in Tansley. Close by was Spout Farm, run by Gervase Taylor, farmer and Milk retailer. It is possible this photo was taken at Spout farm. 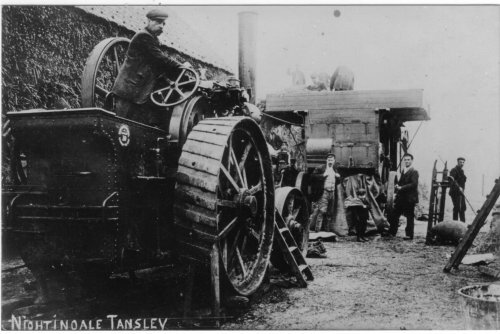 The time for threshing had arrived and one of these powerful, steam driven, machines was owned by Mr Nightingale of Tansley Knoll. He often kept it in the stack yard of the Royal Oak pub, but when he travelled to farms some distance away he would tow a "caravan" behind and use it for his accomodation. 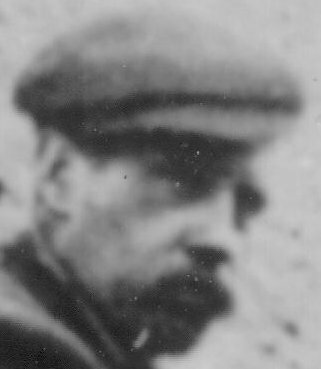 Keith Taylor dates the photo at about 1914. My guess is 1906, estimating William's age at about 38 not 46.